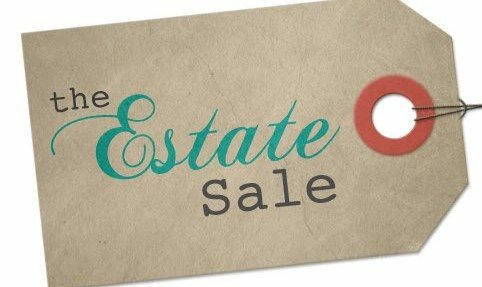 The first step is to contact a few reputable auction and estate sale companies. Ask about their terms and how they run their business. Most will have a detailed contract that lists what they will do for you as well as their commission and minimum price to conduct a sale. The second step is to gather others to help sort items into categories: distribute to heirs, toss, donate, or keep for the sale. The third step is to put like items together in a pleasing arrangement–exactly like home staging. The fourth step is to do some research as to the value of certain items and then price accordingly. The sales company can price out lesser value items. The 4 upstairs bedrooms have a specific purpose–again, like home staging. 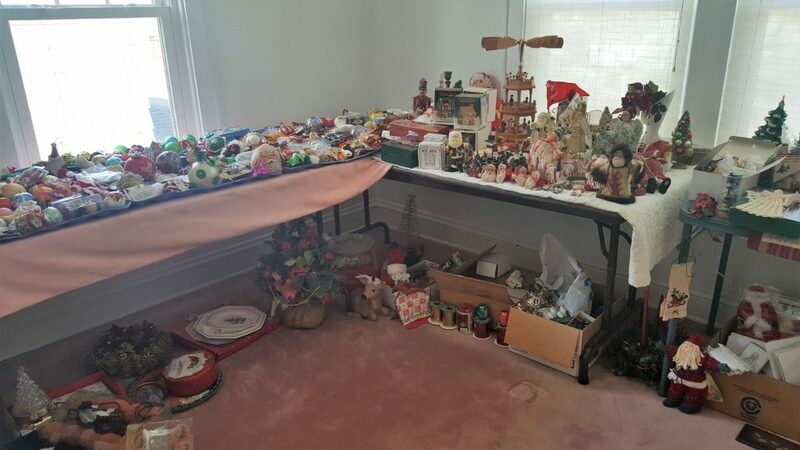 The Holiday Decoration Room holds numerous Christmas ornaments, decor, and folk art all having to do with either Christmas, Halloween, or Easter. 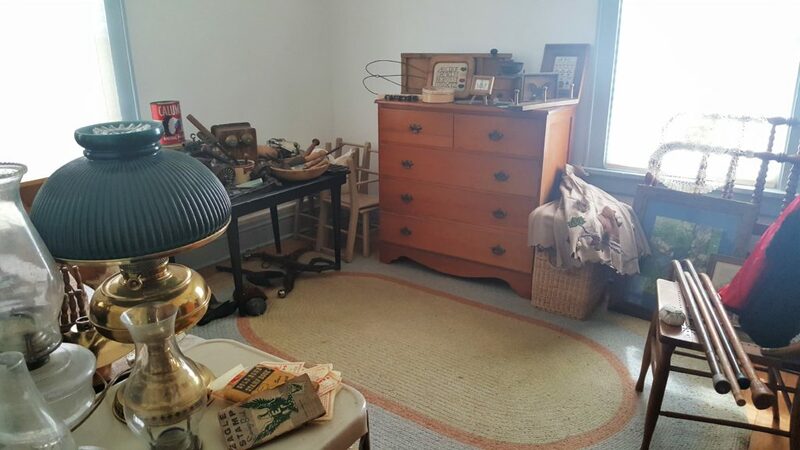 The Antique Room holds primitive antiques and collectibles, including hames, gas hurricane lamps, a Jenny Lind twin bed frame, iron works, and dressers. 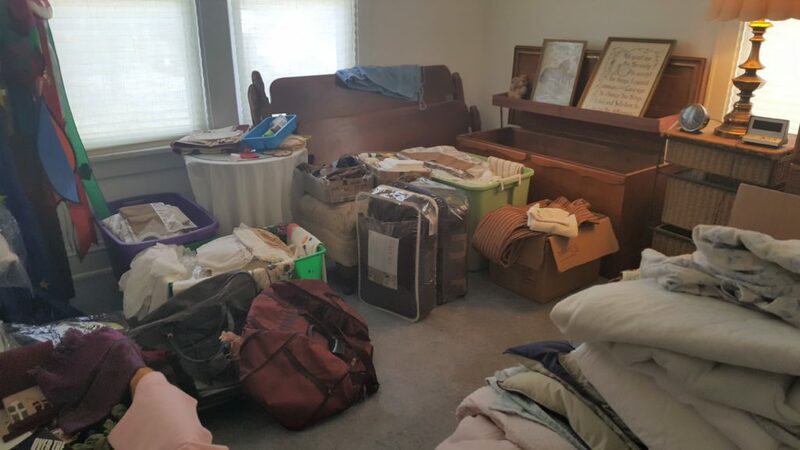 The Linen Room holds quilts, wind socks, luggage, crocheted doilies, embroidered dish towels, a dresser, a double brass bed frame, and a double wood bed frame. The fourth bedroom holds office equipment: desk, chair, file cabinet, printer, office supplies, and mounted fish. 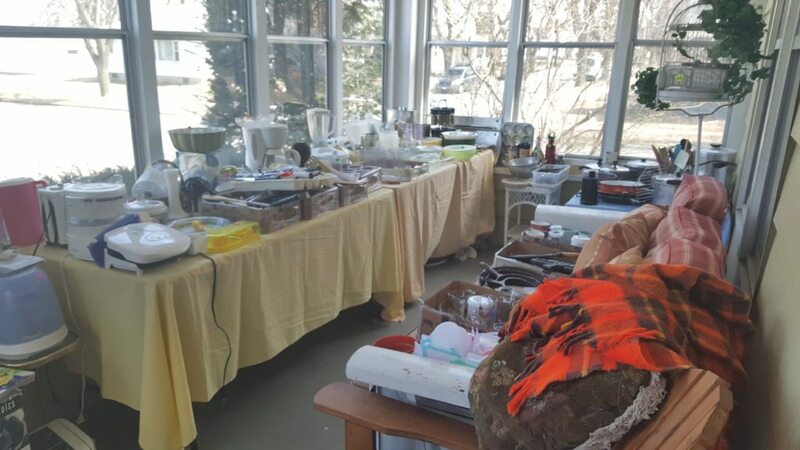 The enclosed front porch holds various kitchen items and accessories, plus those “hard-to-find” items of yesteryear. Who uses a garlic press these days? What about fondue pot? Anyone for a decorative bird cage? 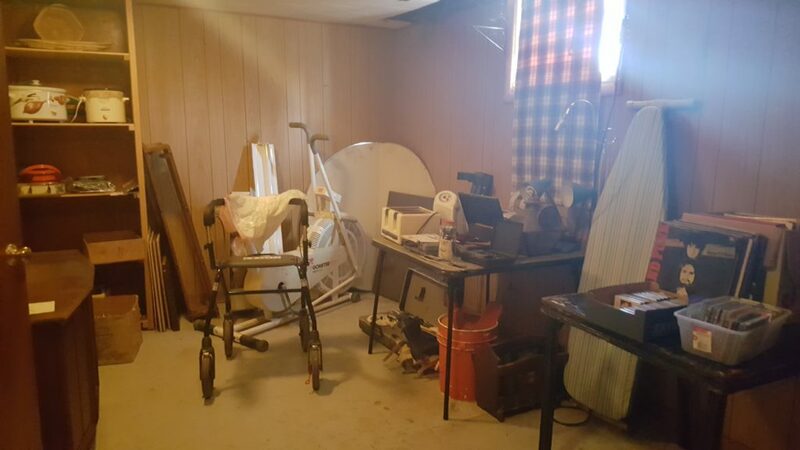 Both the basement and the two-car garage have items neatly displayed. 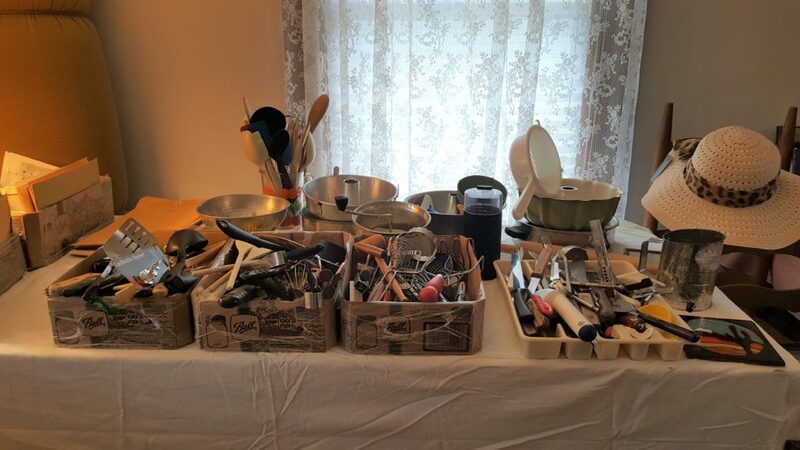 Come and get a bicycle car rack, a gas grill, lawn tools and lawn chairs, plastic food containers, a VCR, an exercise bike, a working console record player with albums, an iron board, and a mobility chair. 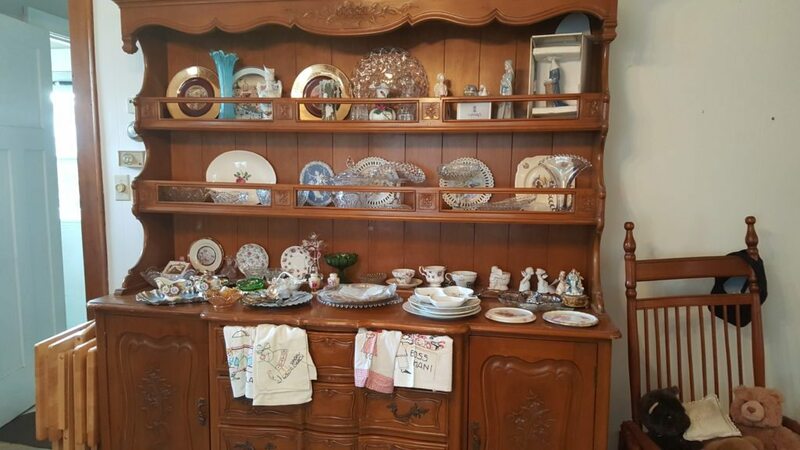 It is amazing how much stuff one collects throughout their lifetime. Please do yourself and your heirs a huge favor by selecting items to keep that are most meaningful, significant, useful, or give you joy. The rest of the items can be given away or sold to others who may find joy in them. You do not come into this world with possessions, nor do you leave with them. Call Premiere Home Stagers at 608-345-9396 to help you with your meaningful items. Does Your Realtor Recommend Staging?